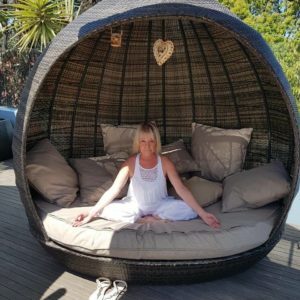 Jennifer Fitzsimmons is the founder of Pathways Academy of Life and Pathways Country Yoga Retreat based in Kwa Zulu Natal, South Africa where she hosts 200 Hour Yoga Teachers Training Certification, a variety of spiritual workshops, yoga retreats and classes. She is the author of her published book Pathway To Wellness. As a qualified Life Coach she specializes in transforming lives in wellness and fulfillment. Jennifer is a qualified and registered Yoga Teacher through Ishta School of Yoga and Health. She is also a qualified Kundalini Yoga Teacher (as taught by Yogi Bhajan) through 3HO and teaches both styles. Jennifer is also a full member of The Yoga Teacher Fellowship of Southern Africa, thus the International Yoga Federation; she is also registered with International Kundalini Yoga Teachers Association and 3HO South Africa. She obtained a full distinction, Life Coaching Diploma through The Life Coach Institute in the UK. Jennifer has been practicing Yoga for 21 years and teaching for 18 years. She has also trained teachers for the last 13 years. It is Jennifer’s intention to coach people life changing techniques to transform their lives. She teaches a way of living, which brings self realization of who we are and what we are capable of. She has completed a collection of Yoga voice guided meditation, relaxation and visualization CD’s and her book Pathways to Wellness. This book is a life changing gift.